Many academics have strong incentives to influence policymaking, but may not know where to start. We searched systematically for, and synthesised, the ‘how to’ advice in the academic peer-reviewed and grey literatures. We condense this advice into eight main recommendations: (1) Do high quality research; (2) make your research relevant and readable; (3) understand policy processes; (4) be accessible to policymakers: engage routinely, flexible, and humbly?Read More. findings of the evaluation, and highlight policy implications for future recruitment and retention initiatives. This event is presented in partnership with Chatham-Kent Tourism. This event is also supported by Grey County Tourism, Simcoe County Tourism, Headwaters Tourism, Kawartha Lakes Tourism, and Kawarthas-Northumberland (RTO8). Click here for more information. Oregon has had notable success in protecting its agricultural lands from development using land use planning, and is often held up as a model in the North American context (Gosnell et al., 2011). Oregon’s experience is particularly interesting in the Willamette Valley, a small area which contains some of Oregon’s best agricultural land and the majority of its population.This policy brief describes lessons from Oregon’s land use policies and outcomes for farmland in the Willamette Valley which may be relevant in other regions where the pressure of population growth and development threatens loss of high quality agricultural land. Cameron will be performing an evaluation of the Rural Policy Learning Commons (RPLC), an international multi-disciplinary network of researchers, practitioners, and policy-makers focused on identifying and analyzing rural policy options, building collaborative partnerships, and disseminating information and knowledge.Cameron’s research will be guided by three primary research questions: 1) What have members of the RPLC learned about the value of creating partnerships? 2) How can project partnership lessons be transferred into the future to ensure a productive RPLC legacy? And 3) How has the RPLC project contributed to rural policy? We encourage you to connect with Cameron by sharing your knowledge, expressing an interest in this initiative, or connecting his initiative to other folks who could benefit or contribute. 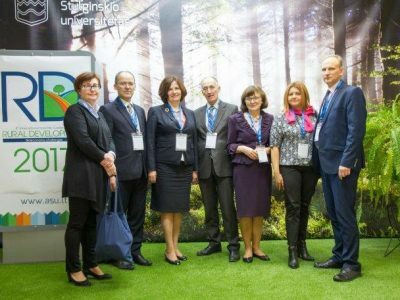 We are delighted to invite you to participate already in the 9th International Scientific Conference ‘Rural Development 2019: Research and Innovation for Bioeconomy.’ It has already become a biannual tradition to meet colleagues from all over the world here. In addition, we are pleased that this event has become a common area for international scientific interdisciplinary discussion on issues of rural development and innovations.CLICK HERE for further details. Social enterprises are increasingly a tool in the community development toolbox. Using the excerpts from that event and the conversation in the studio with Dr. John Schouten, Canada Research Chair in Social Enterprise, and Kimberly Orren, director of Fishing for Success, this episode is your primer on the role social enterprises could play in rural development. The Trump administration has certainly marked a radical departure in some (though not all) of the policy orientations familiar to observers of the U.S.–Canada relationship.An increasingly important question, then, is whether this relationship, on the whole cordial if viewed from within the limited prism of government-to-government relations, will become increasingly strained as climate change takes a greater physical, financial, and emotional toll on the continent. For a list of archive webinars, please click here. #RuralUK - "The Campaign to Protect #Rural #England @CPRE said such measures would regenerate run-down areas without destroying precious stretches of #countryside to meet the UK’s #housing needs"